Caesar is a board certified physical therapist and acupuncturist in the state of New York. His treatment approach emphasises the use of functional exercises and successfully integrates the philosophies of both Eastern and Western Medicine in the treatment of common and complex musculoskeletal dysfunctions. Caesar creates custom, comprehensive, patient centered rehabilitation programs for all his patients and is especially focused on treating orthopedic conditions of the spine and extremities. Over the years he has become increasingly drawn toward exercises focusing on balance, core control, and internal stability. In addition, his independent studies in the Russian Martial Arts stand apart from other conventional training models because of its strong emphasis on breath control, reflex conditioning and the psychology of exercise. In addition to acupressure, tender point release and other advanced manual skills employed within the branch of Chinese Physical Therapy called Tui Na, Caesar favors the gentle joint alignment methods of the Mulligan Technique and is a Certified Mulligan Practioner. Caesar contributes to the HD Blog and is an avid artist and screenwriter. Dr. Comet graduated from Long Island University’s doctoral program for Physical Therapist and has since been working with orthopedics and sport injuries. Dr. Comet continued to pursue excellence in orthopedics and completed the orthopedic residency program at Temple University while working alongside experts in the field. She is an orthopedic clinical specialist (OCS) from the American Physical Therapy Association’s Specialization Academy. And has since become a board certified specialist for Sports in 2016 (SCS). When Dr. Comet is not treating she is teaching as an adjunct professor at Long Island University for both the Physical Therapy and Occupational Therapy departments. Her passion for Physical therapy goes beyond the clinic and academia and has resulted in her newfound interest in research. Dr. Comet has co-authored two articles and presented at the American Academy of Orthopedic Manual Physical Therapists conference in 2015. Currently, Dr. Comet is pursuing her fellowship in orthopedic manual therapy through Regis University in order to further her expertise. Dr. Comet has always enjoyed playing sports, dancing, and remaining active and has used her experiences as an athlete with several injuries to help guide her as a Physical Therapist. Helping people through physical ailments has become Rob's lifelong passion, one he first encountered when his father had to seek treatment for persistent back and knee trouble. Rob began doing volunteer work at physical therapy practices a family friend owned in Brooklyn and Staten Island. Inspired, Rob went on to earn Bachelor's (Hunter, 1991) and Master's (NYU, 1996) degrees in Physical Therapy. His formative clinical years were at the highly-regarded Rusk Institute of Rehabilitation Medicine, at NYU Medical Center. Rob also became McKenzie certified while working at Rusk. Rob met Greg Hullstrung while both were working at Rusk, and the two launched H&D Physical Therapy in 1997 in a small, ground-floor office in Tudor City. Rob has become expert in functional approaches to physical therapy, core stabilization and manual therapy. Rob wants his patients to return to full participation in the activities they enjoy. In his spare time, Rob likes to play softball, ski, and travel with his family. Rob currently works at our 88 street location and midtown location. Rico has a Bachelor of Science in Exercise Physiology and worked as a personal trainer before obtaining his Doctorate in Physical Therapy from Touro College in 2008. He has a keen interest in health and healing, and believes in the body's capacity to mend itself. Rico has great success with the use of manual therapies, strain-counterstrain, and other exercise techniques. In his spare time, he loves spending time with his young family. Maya is a New York State licensed Orthopedic Physical Therapist, Polestar Certified Pilates Instructor, and an Ayurvedic Holistic Health Coach. She graduated with a Masters of Science in Physical Therapy in 2002 from Columbia University, and received her Doctor of Physical Therapy in 2013 from Temple University. In 2009, she became certified as a Pilate Instructor for rehabilitation on all apparatus through Polestar. In 2016, she became certified as a Holistic Health Coach. Currently, she is pursuing a yoga certification through Sivananda Yoga. She is a holistic practitioner who does on -on-one manual therapy, combined with Pilates based exercises, with an emphasis on treating the whole person using Ayurvedic healing recommendations, which focuses on healthy living, with therapeutic measures that relate to physical, mental, social and spiritual harmony. Maya has a wide variety of clinical experiences in outpatient sports medicine practices, hospitals, and rehab centers since 2000. She has worked with a diverse patient population including athletes, and pre and post-surgical patients. She has taken extensive yearly continuing education courses with the Institute of Physical Arts, Maitland, and Mulligan, as well as attended numerous conferences since 2000. During her free time, she enjoys yoga, running, hiking, rock climbing, Ayurvedic cooking, reading and volunteering. She has worked the medical tent for the Brooklyn half marathon, and the New York City Marathon. She has traveled extensively in Europe, Asia, and the Americas. She also speaks Spanish, French, and Malayalam. Aaron attended undergraduate school at the University of Michigan, and graduate school at New York Medical College. He has 20 years of experience in the field of sports medicine. In 2001, Aaron was recognized by the Hospital for Special Surgery (HSS) as an Advanced Hip Clinician. He works closely with NYC’s top physicians, and as a Certified Mckenzie clinician, has become an indispensable resource for individuals with pain resulting from spinal disorders. He owned his own physical therapy practice at the 92nd street Y, and in 2014, joined the H&D team at our 88th street location. Aaron also holds a United States patent on an innovative ankle brace that has undergone clinical trials in several European markets. In his free time, he loves to play tennis and cook in his wood-burning pizza oven! Aaron currently works at H&D's upper east side location. Ginny graduated from New York University in 1988 with a Bachelor’s degree in Physical Therapy. Since becoming a physical therapy Ginny has worked in a multitude of patient populations including pediatrics, sports medicine, orthopedics and neurological disorders. She has worked on both the east and west coast and ran her own practice from 2006-2014. Ginny’s work combines a strong focus on manual therapy, postural re-education and core strengthening. Her hands on techniques include, muscle energy technique, myofascial release/ soft tissue mobilization, and craniosacral therapy. Ginny blends the movement philosophies of the Pilates, the Feldenkrais method, and Tai Chi in her approach to re-educate functional movement. Utilizing all of these practices, GInny can better treat injuries in a whole body approach by addressing and facilitating different interconnect systems of the body. In her spare time, Ginny loves to cook, workout and be out in nature with her husband and son. Pat earned her M.A. in Applied Physiology at Columbia University and her B.S. 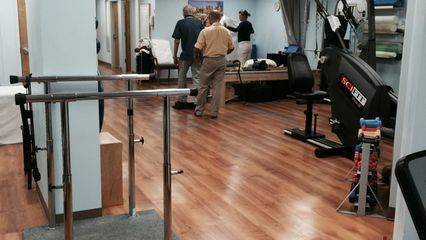 in Physical Therapy at Downstate Medical Center, SUNY. She was the Academic Clinical coordinator and Assistant Professor at Long Island University’s Physical Therapy program and Adjunct Professor in their Advanced Masters Program. Patricia has lectured in the community and has published research in the field of Sports Medicine. She has enjoyed over 25 years of clinical practice. Her special areas of interest include prevention and treatment of musculoskeletal injuries that occur in the workplace, home and sports arenas, particularly, running injuries. In addition, Patricia has expertise in cardiac and pulmonary conditioning across the health spectrum. Matthew’s interests in physical wellness and rehabilitation began in Los Angeles, CA where he worked as a personal trainer and received his bachelors of Science in Exercise Sciences at California State University, Los Angeles. Matthew moved to the East coast to achieve his Doctorate in Physical Therapy from New York University and became a Certified Strength and Conditioning Specialist. Currently, Matthew works at Mount Sinai St Lukes’s in acute care where he has gained experience in an array of clinical areas including orthopedics, neuromuscular, and cardiopulmonary rehab. In his time off, Matthew enjoys playing basketball with his friends, cycling in the city and paddle-boarding with his wife. Matthew practices out of our 88th street location. After having a career path transition from medicine to physical therapy. Phillip entered rehabilitation by the way of personal training out of a small gym in Iowa. Subsequently, he received his Doctorate in Physical Therapy from New York University. In this time, Phillip has also become a Certified Strength and Conditioning Specialist and has had numerous clinical experiences, including vestibular and sports rehabilitation. Paramount is that he has recognized the inseparably intimate relationship between the body and mind as a validated reality, and the implication this relationship has on the quality of life. This drives his passion in helping to restore function on an individualistic approach , and empowering the patient to be an integral part of their recovery. In his spare time Phillip works as a physical therapy at Lenox HIll Hospital, and expands his knowledge clinically in the areas of orthopedics, cardiovascular rehabilitation, exercise physiology, and prevention. And it would not be uncommon to find him exercising or finding a way to travel with his wife. Palvi received her undergraduate and doctoral education in physical therapy at Touro College in New York earning her B.A., and M.S. in 2003 and her Doctorate of Physical Therapy in 2006. Throughout her career, she has worked in a multiple settings such as outpatient orthopedics, nursing homes, home care and schools. SHe has experience working in a multitude of patient population including pediatrics (birth to 12 years old) sports medicine, orthopedics and neurological disorders. Palvi’s work combines a strong focus on manual therapy, myofascial release, soft tissue mobilization, trigger point release, and muscle energy techniques. Palvi has continued to enrich her clinical skill and knowledge by attending continuing education courses with special focus on pelvic health with Herman dn Wallace. Palvi finds great satisfaction in helping her patient regain their ability to return to function at home, work and in recreation activities. Beth attended Long Island University-Brooklyn Campus where she earned her Master’s degree in Physical Therapy in 1987. She then went on to receive her Doctorate in Physical Therapy in 2007 from the same institution. She has worked in a variety of adult care settings including geriatric rehab, acute care hospitals, home care and outpatient care. Highly motivated to learn new treatment techniques and sharpen her clinical skills, Beth actively pursues professional continuing education. In 2009, she became certified in the McKenzie Method of Mechanical Diagnosis and Therapy of the spine. Her treatment approach is guided by achieving the optimum function with minimal pain. For each patient she designs a customized program, combining manual treatment, functional exercise and a home program to restore functional ability. In her free time, Beth volunteers with a local community theater group which raises money to benefit NYC based charities. She enjoys traveling, hiking and ballroom dancing with her husband. Eileen received her Bachelor of Science degree from Boston University and her Master’s degree from New York University. She has over 30 years clinical experience. Eileen began at NYU Rusk Institute moving on as the Assistant Chief Physical Therapist of Cardiopulmonary Rehab at New York Cornell. She has been a faculty member at NYU School of Physical Therapy and a founding member of the Hospital for Special Surgery Rehabilitation Network. Prior to merging with H&D Physical Therapy, Eileen owned Shepard Physical Therapy, a private practice located in Manhattan. In addition to treating general orthopedics and neurological conditions, she also specializes in Vestibular Disorders. She studied Vestibular rehab with Dr. Susan Herdman at Emory University and has had advanced studies in cervicogenic dizziness and balance disorders. In addition, she has lectured on and designed fall risk programs. She is excited to join H&D Physical Therapy! Marcia has had a passion for physical therapy ever since she was a young girl growing up in Colombia. She came to America when she was 10 years old and quickly adapted to her new homeland. She successfully navigated through her schooling and worked hard to earn a spot in Touro College’s Physical THerapy program where she graduated with a DPT degree. While at Touro, Marcia was the school’s top performing student in manual therapy. After graduating, she has had over 10 years of experience in outpatient therapy as well as 5 years in a rehabilitation environment with a concentration in orthopedics. Marcia is known for taking the time to understand each patient’s individual needs as well as providing the respective care needed to enhance their quality of life through the highlest level of compassionate therapy.